As I mentioned in this feature request An UI set in my last updated comment, this Node would allow us to add borders to whatever Layers. Therefore it would also enable Borders for custom Buttons without the need of a specific border option in the "Make Button" Node. I also wanted to create a topic about layers but as this is somehow linked to this I'm asking it here, you can displace it to the forum if you prefer. 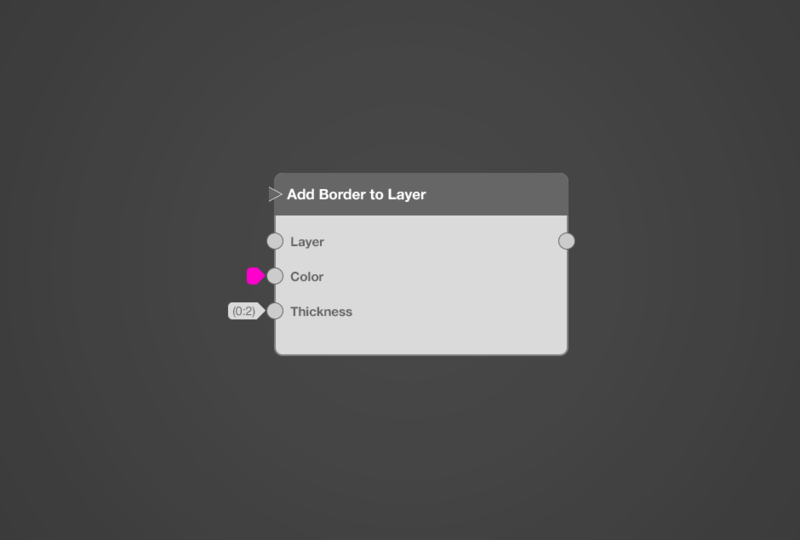 Why are most of the Vuo Layers related nodes implemented the way you have to connect it to "Rendered Layers" output and then select a Layer Name ? Receive Mouse Drags on Layers. In QC, I could get layer bounds directly from layers and use it to calculate stuff in the composition for other layer f.e. Here we have to make a big loop. Plus, not all layers can be given names if I'm correct ? F.e. the "Make text layer" doesn't allow that. So how could I use this layer in "Get Layer Bounds" ? Anyway, I would like to know why Get Layer Bound could not be done the same way as this mockup on top. why Get Layer Bound could not be done the same way as this mockup on top. Get Rendered Layer Bounds gives the actual size of the layer as it's rendered on the screen — so it needs to know how big the window is, and it needs to know all the transformations that get applied to the layer. It's different from the Get 3D Object Bounds node (note the absence of the word "Rendered" in the title) which gets the bounds of an abstract object, without considering how it fits into the window. We have an internal feature request to eventually add an equivalent abstract Get Layer Bounds node. Feel free to create a public feature request to so the community can vote on its priority. Steve "Get Rendered Layer Bounds gives the actual size of the layer as it's rendered on the screen — so it needs to know how big the window is, and it needs to know all the transformations that get applied to the layer"